recently, Jenny talked about her go-to meals & how her favorite meals are few ingredients, few minutes, and few dishes! i realized those are my goals too, especially during week nights! when you are gone for 12 hours a day, quick & easy is the way to go! during our meal prep, we make a rough menu for the week & shop for groceries based off of the menu. there are some meals that end up on the menu frequently & these are the ones that are quick but delicious! 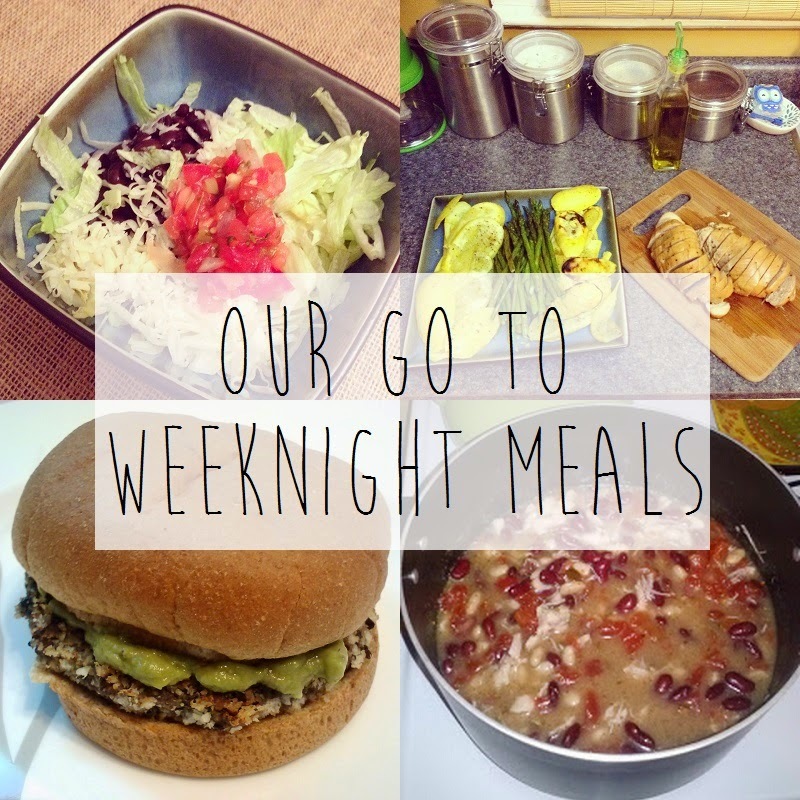 so i thought i would share some of our favorite go to weeknight meals! they are all simple & have become our favorites! we put 2-3 chicken breasts, chicken broth, & a chicken taco packet in the crockpot and cook while we are at work. when we get home, we shred the chicken, put in a bowl & top with lettuce, black beans, lactose free cheese, and salsa! it is kinda like a rice-less Chipotle burrito bowl! this is one of our favorites because it's very quick, very simple & super healthy (depending on the meat you choose)! one thing we love about this meal is that there are endless possibilities with different meats/veggies. so you can eat generally the same meal a lot but not get tired of it! most of the veggies we coat in olive oil, salt & pepper, and grill them. it is my favorite way of eating veggies! but for sweet potatoes - we cook in the oven! we cut them in 1/2 and coat the insides with olive oil & salt. then we cook them face down on 400 for 30 minutes. it caramelizes the top & it is so good! we mash them up, then add cinnamon (no sugar) & salt! i hated sweet potatoes before i tried them this way & now i love them! we try to have a meatless meal every so often, just to cut down on the meat. i love black beans, so they are normally my non-meat protein of choice! when Thomas & i were dating we found this spicy black bean burger recipe & never looked back! you just mash up the black beans, add breadcrumbs and spices, & cook! you can find the recipe here! this is a recipe that Thomas had when we got married. it is very quick, delicious, and pretty healthy! we make it a lot when we have people over on weeknights because it's so quick & is easy to double! you can find the recipe here! these are basically make-at-home personal pizzas. super easy, customizable, and as healthy as you wish to make them! you can find the recipe here! this is a recipe i discovered when we did whole30 earlier this year. it is one of my husband's favorites so we make it fairly often! since the chicken & vegetables cook in the crockpot for hours, they really soak up the juices & come out so flavorful! i never ate carrots before i tried them like this! you can find the recipe here! another crockpot favorite! we add our favorite spices to the tenderloin & cook in the crockpot while we are at work. when we get home, we cook some bowtie pasta & add basil pesto to it! sometimes we even eat the pesto pasta by itself because it's so good! or we add chicken to the pasta! our fridge has so much junk on it! these menu printables are from Every Day Planner and i love them! it is nice to have a menu hanging on my fridge for easy access each day! i check the menu in the morning & make sure we have done the required prep work if we are cooking it in the crockpot! These are definitely practical! You guys eat a lot of salmon, at least according to the menu! :P I know its healthy, I'm just not the biggest fan of salmon so we only ate it once or twice a month in the US. We made a lot of variations of fajitas/quesadillas/tacos with chicken and veggies...and a lot of variations of rice with chicken and veggies for our regular everyday meals. I love the chalk style menu planners! How fun!!! I never meal plan, despite the fact that I make 3 meals a day!!!! Something like this would be super helpful! I love your go to meals! I have been looking for some new meals to add to our calender and these looks so good! Thanks for those suggestions! My husband and I take turns cooking (whoever gets home first starts dinner), but we are always finding ourselves in a dinner rut (tacos and quesadillas count as two separate dinners, right? Haha). So thanks for this helpful way to stay organized! I love that you plan your meals out for the entire month. It makes things so easy! right?! i love anything chalkboard! :) i would probably end up eating cereal for every meal if i didn't have a plan! i am just not good at spontaneous cooking!! thanks Ashley! they are so cute - i love them too! thanks Samantha! we try to keep it simple & healthy but enough variation! :) i hope you try some & find a new favorite! I love how organized this is! Everything sounds so good, especially those black bean burgers! Ooh so many good recipes to try now! I'm going to definitely have to try the sweet potato method you use and the ginger crock pot chicken sounds great. We make black bean taco salad about once every 10 days because it's so easy and filling but meatless. Thanks for these great ideas! ooooo I like these suggestions! I have a few "go tos" myself, and it is TIME for me to switch things up! favoriting this!! they are SO SO good that way! :) i hope you enjoy them Haley! thanks Stephanie! these are our timeless recipes - our capsule menus if you will! :) we love them! the ginger crock pot chicken is SO good & so healthy! the veggies really soak in the juices and man they are so good! We just do rice in the rice cooker, black beans (heat for 5 mins on the stove), chopped tomatoes, onion, lettuce, and shredded cheese. I like to add a little smoked tabasco sauce and some crushed corn chips to the top. Super fast and so filling. Looking forward to trying the ginger chicken! Such great suggestions. It's always good to have some go tos that you can make when you run out of ideas, are low on time, or are just tired. Also, I love homemade black bean burgers! Thanks for the shoutout! Those are some great go-to meals. I made black bean patties one night and we loved them, I should pull that recipe out again! black bean burgers are SO good! Congratulations! 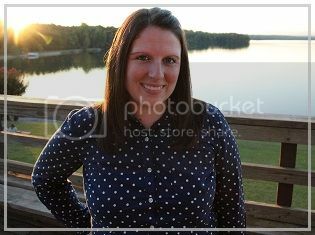 This post was the # 3 most read on last week's link up at somuchathome.blogspot.com. I featured it on this week's link up. I hope you will come join link up #13. God bless.